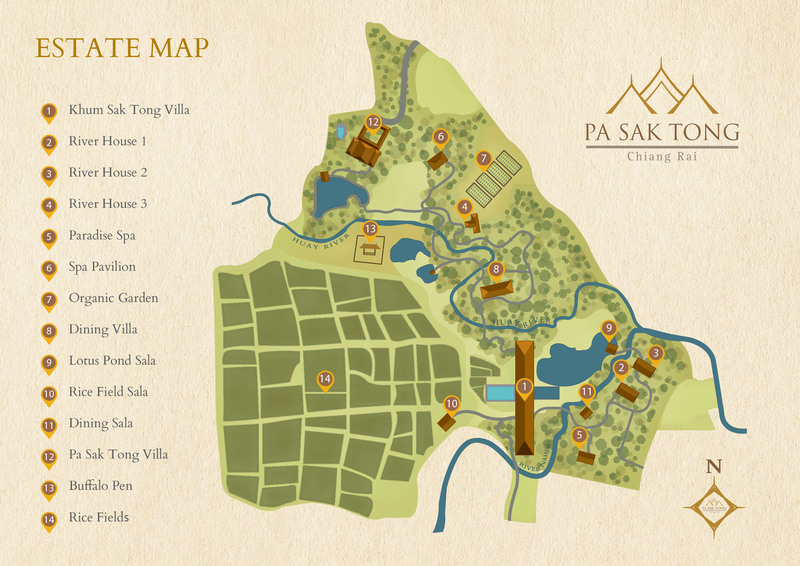 Pa Sak Tong is perfectly located to explore the outstanding natural beauty, ancient settlements, Buddhist shrines, and unique hill tribe culture of Chiang Rai province. The province is the original capital of the Lanna Kingdom and is rich in historical significance. The City of Chiang Rai is considered small by Thai standards, but has a very unique feel to it and has many historic attractions that can be reached on foot or by bicycle. A melting pot of cultures, Chiang Rai is home to many diverse ethnic groups that include Thai, Chinese, nine different hill tribes, Indian, Burmese and Tai Yai. Friendly and easy to get to know, people in northern Thailand look forward to every opportunity to share their special culture with visitors. Pa Sak Tong is located next to the sleepy village of Suan Doc, meaning ‘garden of flowers’. Mostly an agricultural community, Suan Doc is surrounded by rice fields and tea plantations. The people of the community are a mix of traditional farmers and hill tribes. They are friendly, gentle and helpful. On a leisurely stroll through the village, you’ll rarely encounter other travelers — only the true living Lana culture and heritage of northern Thailand. Quaint and quiet, the village still offers a variety of truly Thai memories, like hiking or biking in fog-kissed foothills, offering food to passing monks in the early morning, or stopping by the local elementary school to give the students a quick (but much appreciated) English lesson. "If you want quiet, peaceful, and healthy — it is perfect!" Explore northern Thailand in style. Contact us to plan your dream trip to Chiang Rai, Thailand.